The package of constitutional amendments passed the nearly 3,000-member National People’s Congress almost unanimously, with just two opposing votes and three abstentions. The vote further underscored the total dominance of Chinese politics possessed by the 64-year-old Xi, who serves simultaneously as the head of state, leader of the ruling Communist Party and commander of the powerful 1 million-member armed forces. The move upends a system enacted by former Chinese leader Deng Xiaoping in 1982 to prevent a return to the bloody excesses of a lifelong dictatorship typified by Mao’s chaotic 1966-1976 Cultural Revolution. “This marks the biggest regression in China’s legal system since the reform and opening-up era of the 1980s,” said Zhang Lifan, an independent Beijing-based political commentator. “I’m afraid that this will all be written into our history in the future,” Zhang said. The change is widely seen as the culmination of Xi’s efforts since being appointed leader of the party in 2012 to concentrate power in his own hands and defy norms of collective leadership established over the past two decades. Xi has appointed himself to head bodies that oversee national security, finance, economic reform and other major initiatives, effectively sidelining the Communist Party’s No. 2 figure, Premier Li Keqiang. In addition to scrapping the limitation that presidents can serve only two consecutive terms, the amendments also inserted Xi’s personal political philosophy into the preamble of the constitution, along with phrasing that emphasizes the party’s leadership. “It is rare nowadays to see a country with a constitution that emphasizes the constitutional position of any one political party,” Zhang said. Voting among the legislature’s hand-picked delegates began in the mid-afternoon, with Xi leading members of the party’s seven-member all-powerful Politburo Standing Committee in casting their ballots on a stage inside a cavernous hall. He placed his orange ballot paper in a red box bearing the official seal of state. “The constitutional amendment item has passed,” the announcer declared to polite applause. “We believe in the future that we will continue with this path and discover an even brighter future,” Shen said. In a sign of the issue’s sensitivity, government censors have aggressively scrubbed social media of expressions ranging from “I disagree” to “Xi Zedong.” A number of prominent Chinese figures have publicly protested the move, despite the risk of retaliation. Officials have said the elimination of presidential term limits is aimed only at bringing the office of the president in line with Xi’s other positions atop the Communist Party and the Central Military Commission, which do not impose term limits. 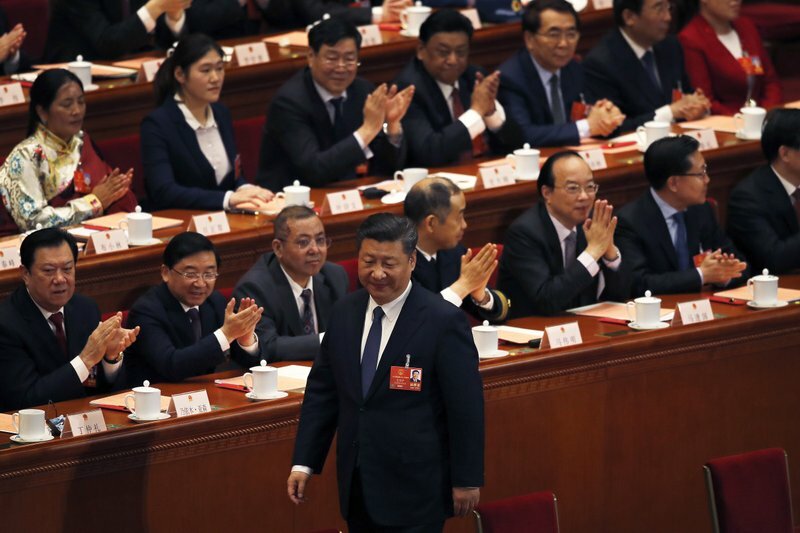 “In fact, the more Xi Jinping’s position is consolidated and the longer his governing time is to last, the more secure it is for the continuity of the policies,” said Liu Jiangyong, a professor at Renmin University’s School of International Relations. The move has crushed faint hopes for political reforms among China’s embattled liberal scholars and activists, who now fear even greater repression. China allows no political opposition in any form and has relentlessly persecuted independent groups seeking greater civic participation. Leading Chinese officials have repeatedly rejected any chance of adopting Western-style separation of powers or multiparty democracy. Nevertheless, Xi’s confident, populist leadership style and tough attitude toward corruption have won him significant popular support. “I will definitely support this constitutional amendment and this government. This is a powerful and strong government,” Zhao said. He added, however, that he was concerned that the public discourse lacked a space for dissenting voices.